Here is a list of the best free online speech to text converter websites. Using these websites the text you narrate is converted to text. You just have to have a nice working microphone. Then, as you speak, the speech is converted to text. In case of some complex words, you can also rectify your mistakes and enter the text by making use of the keyboard. Then you can copy the text to the clipboard, download the converted text as TXT, DOC, PDF, and many more. The converted text can also be used to translated into numerous other languages, and can also be narrated back. You also have the option to share it on social media sites, and mail it to someone. 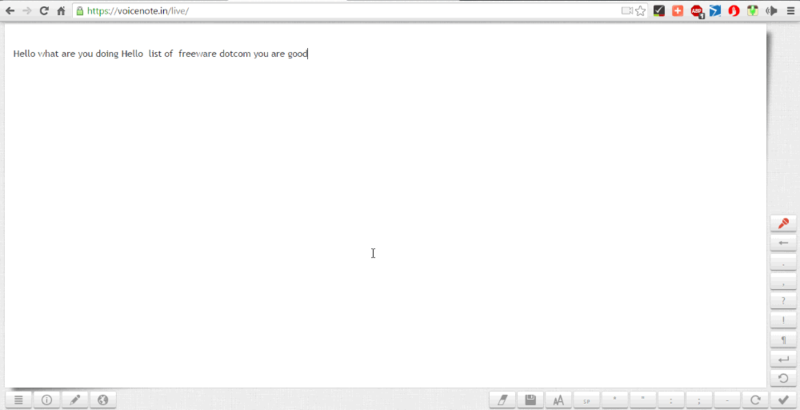 The Website that I like the most is SpeechPad. It is due to the fact that it offers a number of additional options. It comprises of almost all the basic features of a good speech to text converter. It is quite simple to use, can perform translations, and transcriptions. You can also insert different symbols, and also make use of on screen keyboard. Also check out the list of Speech To Text Converter Software, Text To Speech Software, and Text Encryption Software. SpeechPad is a simple and easy to use website which lets you convert speech to text. Just click the button "Start Recording" and narrate the text which is then converted to text. The option to type the text in capital letters can be selected by choosing the upper case letters. After the recording, the converted text is displayed in the output text box. The option to insert different symbols can also be selected. The speech language option can be chosen which may be either English, French, German, Spanish, Italian, and Russian. The settings can be changed to turn off sounds, restart on errors, execute voice commands, replace punctuation, transform to clipboard, and OS integration. Option to choose the option to copy in the clipboard, or download the file as TXT. 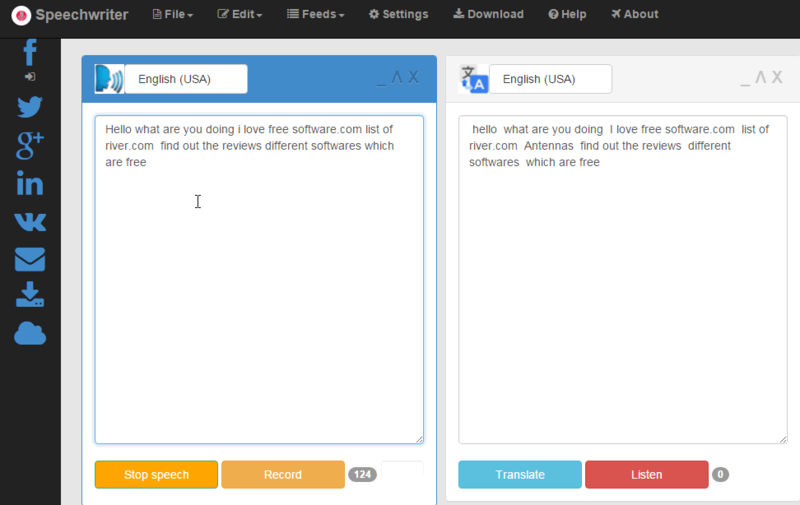 Can also choose the option of transcription, and translation to view desired results. Speechnotes is a simple website which converts speech to text as you speak. Just click on the microphone button, and start speaking in order to convert the speech to text. There are different voice commands and shortcut options to properly orient the text. Smiley can also be added in it. Different language options can be chosen from the available lists. Finally the text can be copied to the clipboard after editing. The text can be zoomed in zoomed out, and shared simply on social networking sites like Facebook, Twitter, Google+, and Email. The sessions can also be saved locally. 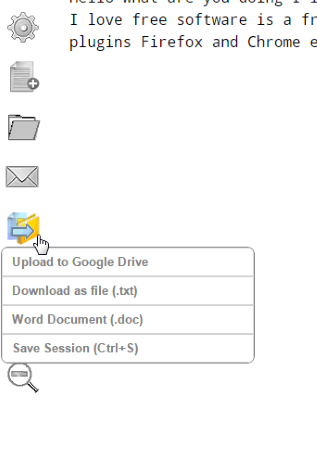 The text can be uploaded to Google Drive, and downloaded as TXT, and DOC. Finally the printout can also be taken. Notepad With Speech is a good website which converts speech into text as you speak. Just click on the microphone button click the button start a speech to text and start speaking. 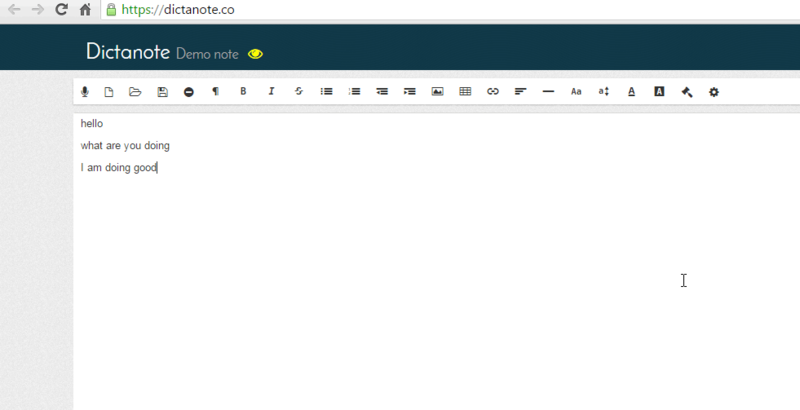 Then you can choose option to insert text to notepad, make modifications and so on. Finally into the Notepad you can also choose different language options in order to suit your needs. 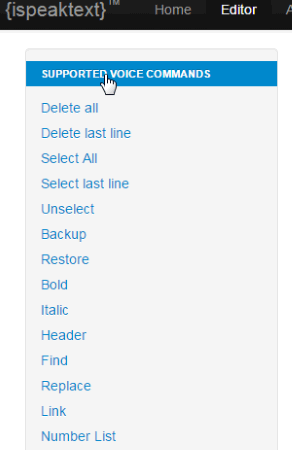 You can also format the text using different pattern buttons available. 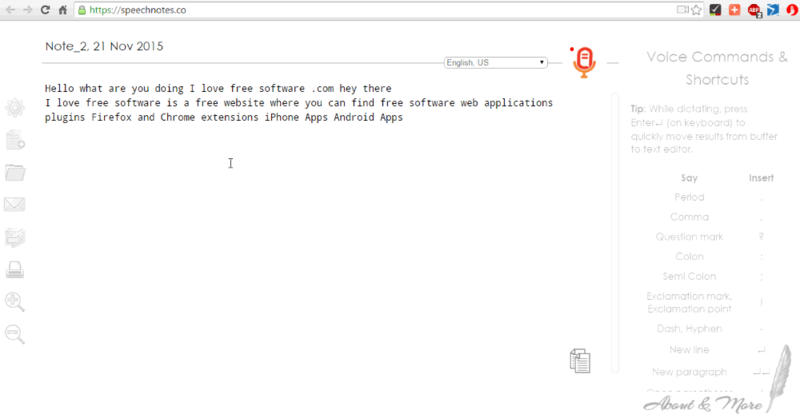 You can also format the text and view its HTML code. It can also be used to insert images and hyper link. The final text can be copied to the clipboard, or uploaded to Google drive. Spell check can also be enabled. VoiceNote II-Speech to text is a simple website which helps in converting speech to text for typing speed. 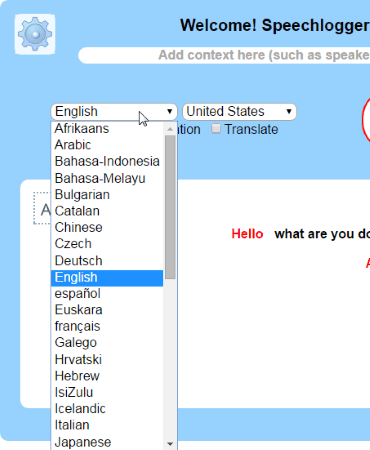 Browse the website, select the language, and start dictating the words through the microphone. 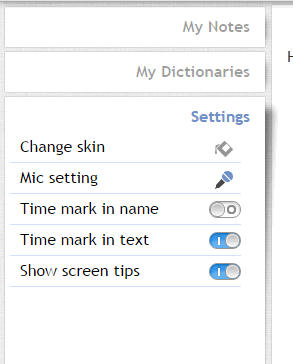 Here you can also enter the text using the keyboard, and add your own dictionary. You can also insert special symbols and new lines to it by clicking on the buttons displayed on the side. The text can also be download as a text file. It also features a Google Chrome extension. TalkTyper is a good website to insert text by speaking. Just browse to the website and click on the microphone button and dictate the text. You can also listen to the text, and edit on your own. 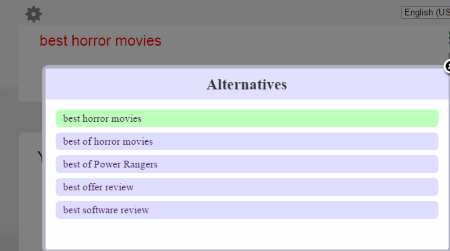 On clicking the alternatives button you are provided with a number of alternatives to choose from. Then the text can be accepted to the dictated list. Can also insert special symbols. Option to copy the text to the clipboard, send the text as email, share on Twitter, take the printout, and also translate the text in a number of languages. You can also dictate in different languages. Click on the option Tools. Select the option of Voice typing. Then a microphone is displayed where you can enable the microphone and start dictating. The dictated speech is then displayed as text. 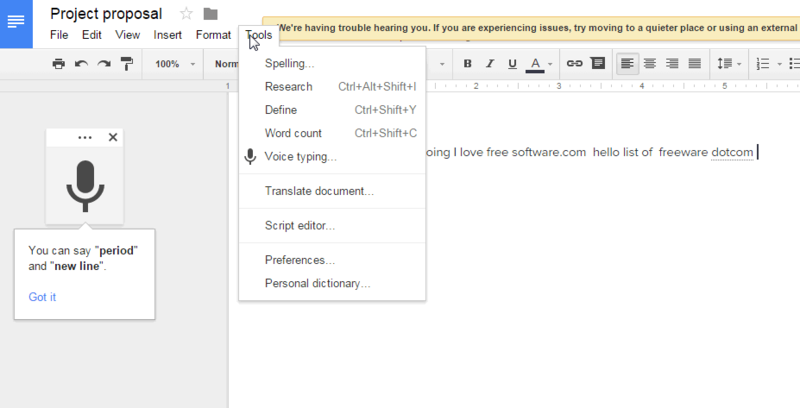 You can also edit the text, format it and use the basic functionalities of Google Docs. The docs are saved online and can be downloaded in different formats, and shared. Google Translate is a good website to perform translations into different languages. It can also be used to input text by dictating. Browse to the website, and click on the microphone button and start speaking the text that you wish to enter. Then the speech is automatically converted to text. You can also listen to the converted text. In case you wish to input the text in different language you can also do so. The translation of the text is also provided. Option to listen to the converted text also and share it on Google+, and Twitter. You can also copy the text to the clipboard. 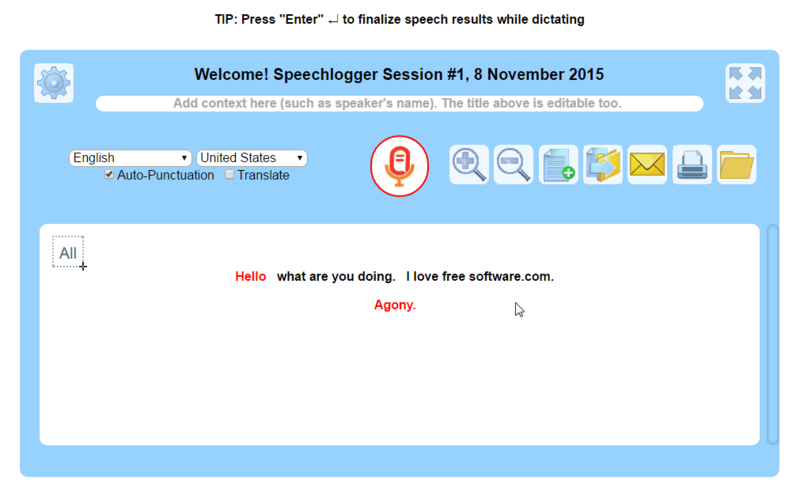 Speechlogger is a simple website which helps you to insert text by speaking i.e. convert speech to text. You can edit the text on your own. The text can be zoomed, and can be downloaded in the form of TXT, DOC, and SRT. 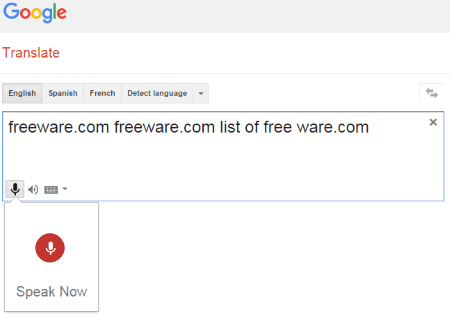 It can also be uploaded to Google Drive, and exported to Google translate. You can also take a printout and Email it to someone. The file can be opened from disk. SpeechTexter is a simple website that converts speech to text as you speak. For this you have to simply visit the website and click on the button start listening. Then you have to speak through the microphone whatever you want to speak. 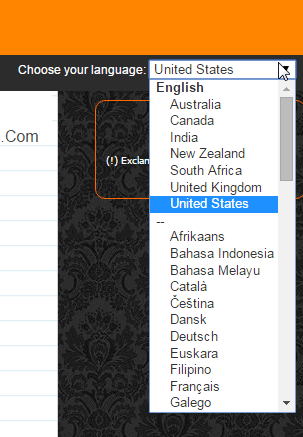 You can also choose the language in which you want to speak. 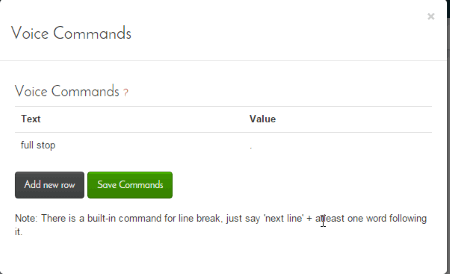 Several commands are also available to induce period, comma, question mark, new line, and paragraphs. The mistaken words can be rectified. Finally the text can be copied to the clipboard for final use. It also features a Chrome app. 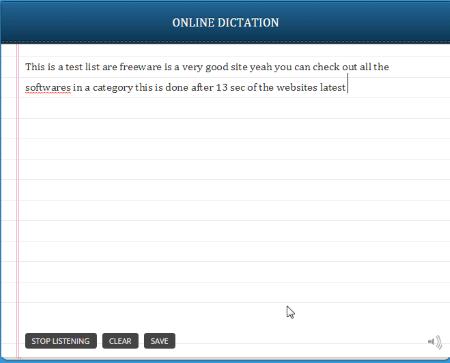 i-Speechwriter is a simple website where you can dictate the text and it is converted for you. Simply browse to the website, click the start speech button, and enable the microphone option. After that you are good to go and the dictated speech is converted to text. You can also choose the option to translate it into some other language. There are a number of punctuation controls options. You can also edit the text on your own and finally copy the text to the clipboard. You can also check out its Chrome Extension. Dictanote is a good website which helps you insert text by speaking. Different alignment options, font color settings can be selected. You can also insert special symbols. Different options to insert table, links, and images can be inserted. You can copy the text to the clipboard. It also features a Chrome plugin. 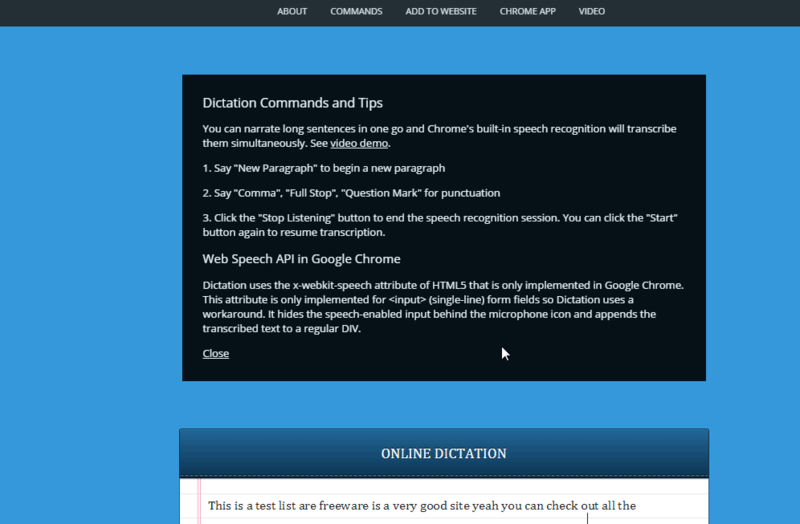 Dictation.io is a simple and beautiful website where you can easily input the text by issuing voice commands. Visit the site and click the start dictation button. Then you simply have to narrate the text. The narrated text is then displayed which can be corrected if required. You can also make use of some of the dictation commands for punctuation, and paragraphs. Finally the output can be saved and downloaded as TXT file. ispeaktext is a simple website where you can speak to type. In order to do that, you have to register into the website first. Click on the speech input button and speak whatever you wish to type. You can also format the text using visual tools, or using supported voice commands. You can also view the source, and find and replace text. 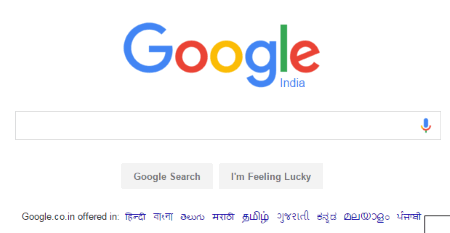 Google is a very popular search engine. In this you can also perform searches using the speech option. 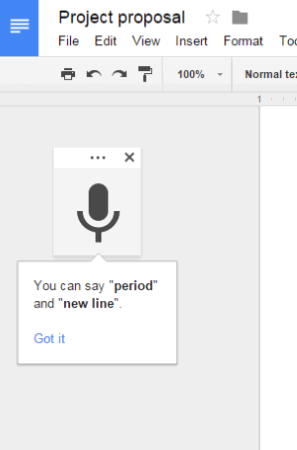 Just visit the Google home page and click on the microphone button and start speaking after speak now is displayed. Then the text that you dictated is searched on the internet.